One benefit of getting together with other LEGO fans at local club meetings is that you get to hear the thought process that goes into their LEGO models. Shawn Snyder (Flickr) has been building fantastic character sculptures for years — remember his amazing Predator bust? — and lately he’s been bringing his figures to SEALUG meetings long before he posts them online. 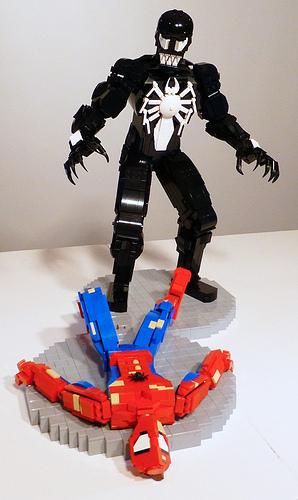 One of his recent figures is the villainous Venom, here taking down Spider-Man. Venom’s brick-built spider logo and teeth are particularly nice. What’s fascinating about Shawn’s building style is that he says he never starts with a particular scale in mind. He always starts by working at building a head until it looks right, and then he works his way down (or not, in the case of his large-scale busts). Shawn’s characters are also nearly always articulated, and he incorporates structural support to enable dynamic posing. My brain just doesn’t work like that. 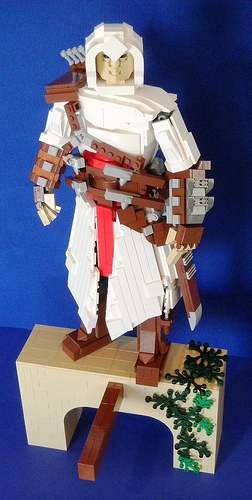 Since it looks like we missed it when he posted it after Emerald City Comic Con last year, here’s Shawn’s awesome Altaïr from the original Assassin’s Creed. I can’t wait to see what he’ll bring to the SEALUG display at ECCC this year, in just a couple of weeks. As he’s not really into social media (or speaking loudly, even in person) he’s definitely one of those “hidden talents” out there in the world. I knew he’d done some great things, but the stuff he brought to our ECCC display last year, like Altair, really hit the mark with that geek audience. Wow. Those are really incredible. I did a double take on that Venom. Looks like an action figure at first glance. ^ I agree…the natural-looking anatomy he’s able to accomplish is incredible.